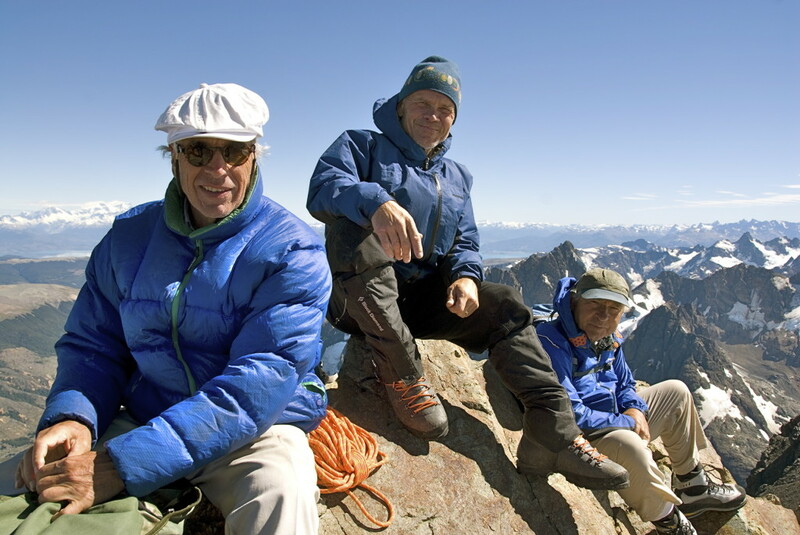 Doug Tompkins (left), Rick Ridgeway (middle), and Patagonia founder Yvon Chouinard during the filming of the 2010 documentary ‘180 Degrees South’ in Chile. Rick Ridgeway, one of the North Face founder and conservationist’s closest friends, survived the kayak capsizing that killed his lifelong buddy. Here he reflects on their awful ordeal, on his friend’s burial, and on the lasting gifts that Tompkins leaves behind. In the days since our friend and mentor Doug Tompkins lost his life in a kayaking incident, we have experienced an outpouring of condolences from thousands of people around the world. The sense of loss from people who never knew Doug, but did know his work, is palpable. A few days ago, at the headquarters of Tompkins Conservation in the Chilean town of Puerto Varas, we had a service for Doug attended by people from up and down the country and Argentina. Kris, his wife, opened the ceremony and spoke in Spanish of her boundless love for Doug, their love of wildness and their deep commitment to the protection of wilderness and wildlife, and their work to save, then donate, two million acres of land to the people of Chile and Argentina—and to all of us. She spoke with dignity and power, with a force that welled from a place in her we had never witnessed. She gave her full power to each sentence and paragraph. Drained, she paused, breathed, and with each breath the power would rebuild until she continued with an even more profound power that none of us had seen before. The next day, we flew with Doug’s body in a private plane south to the Patagonia National Park project near the town of Cochrane. The clouds began to break and in front of us the summit of Cerro San Valentin, the highest peak in Patagonia, appeared above the clouds. Kris moved to the cockpit, and our pilot and close friend, Rodrigo, circled the mountain at close distance. It was a spectacular last flight for Doug. Patagonia National Park was initiated with the purchase of a large sheep estancia, and the cemetery that was part of that ranch is now part of the new park’s buildings and infrastructure. We buried Doug in this cemetery. The dozens of workers and friends in attendance carried in rotation Doug’s casket—simple but impeccably crafted from the wood of the alerce by some of the staff that stayed up the full night finishing it—in a long procession that began from Doug’s beloved Husky airplane, parked in front of the beautiful stone restaurant, and continued along the dirt road past the lodge to the cemetery. Kris once again showed her mettle and gave a heartfelt tribute to Doug and to the Chilean team who were gathered. After Doug was lowered into the grave, Kris, with great solemnity and dignity, tossed flowers on his coffin. Then, one-by-one, all of us in a procession tossed a handful of dirt on the grave. In the days that have followed—days that seem like years—“survival” has been a theme that every one of us has raised independent of the other. Specifically, it is this profound realization that Douglas Rainsford Tompkins is surviving, more strongly than ever, inside us. He is pushing on us already, reminding us that “no detail is too small,” inspiring us “to commit and then figure it out,” helping us realize that the first commitment is to beauty because out of beauty comes love, and only with love can we hope to approach his inextinguishable tenacity to protect what is beautiful, what is wild. The torch was still lit and the fire still burning brightly. Rick Ridgeway is Patagonia’s Vice President of Public Engagement and the author of six books. His passion for mountaineering and exploration have taken him around the world, including the summit of K2 where he was part of the first American team to climb the peak in 1978. This article was originally published on Patagonia’s blog, the Cleanest Line, on December 15, 2015. Los Belgas llegados a esa Región hace más de medio siglo atrás asentándose en las riberas del Lago General Carrera conocieron ese lago como la palma de su mano, hermoso pero peligroso a la vez. En esas aguas falleció ahogado uno de ellos cuando todos aún eran jóvenes. Fue un momento muy terrible y penoso lo que tuvieron que vivir esas familias en su momento, perder a ese ser tan querido y amado. Se dieron cuenta de inmediato que ese lago tan hermoso no era lo que parecía ser a veces, a veces esas aguas eran verdaderas olas de mar. Si don Thomás hubiera conocido esa historia… quizás las cosas hubieran sido diferentes. Recuerdo haber visto un programa de televisión donde se entrevistaba a una de esas familias Belgas, “Al Sur del Mundo”, donde se mostraba un cementerio familiar en el cual descansa el cuerpo de aquél joven y otros familiares de esos colonos. Si aquél es el mismo Cementerio donde finalmente quedarán los restos de don Thomás creo que es un hermoso lugar para que su cuerpo y alma descanse en paz y tranquilidad, en la Patagonia indómita que él tanto amó y luchó por conservar. Finalmente estará muy bien acompañado por esas personas que mucho antes que él también llegaron a colonizar esos hermosos pero a la vez y finalmente indómitos parajes que quién bien los conoce sabe muy bien que no se pueden dejar de respetar. Muy penoso todo lo sucedido, qué difícil será todo sin don Thomás, pero creo que el no podría estar más triste al ver que toda su obra, todo su esfuerzo se terminara aquí. Vendrá gente nueva, gente joven que con renovados ímpetus ojalá quieran seguir sus pasos. Mis más sinceras condolencias a su esposa, tengo la seguridad que don Thomásl la estará ayudando y acompañando siempre desde donde el esté. Eran tan unidos que tengo la seguridad también que el la seguirá acompañando y entregándo su fortaleza por siempre, no será fácil, no fue fácil para todas esas hermosas familias de belgas perder a su hijo y hermano pero debieron seguir adelante, era dura la vida en esos tiempos pero también era hermosa, que lindos recuerdos de esas vivencias quedaron retratados en un librito muy hermoso escrito por uno de ellos y que ojalá la esposa de don Thomas algún día lo pudiera leer, se que la reconfortaría, se que le daría fuerzas para seguir adelante con esta gran obra, el libro “Cuando éramos niños en la Patagonia” por Jean Chenut. En mi comentario anterior quise decir “don Douglas Tompkins” y no Thomas, creo que las emociones y los recuerdos de esas familias belgas que fueron parte de la colonización de esa zona hicieron que tuviera esa confusión por lo que pido las disculpas del caso. En el pueblito de Los Antiguos en el lado argentino, allí vive una de estas familias dedicada a la producción de cerezas en su “Chacra El Paraíso”, (que hermoso nombre) allí la señora Kris creo que encontrará aquél hermoso librito del que hago mención en mi comentario anterior.